That's right, I bought another Sonshapes hook on eBay. I'm getting quite a collection of wooden hooks, but the Sonshapes are definitely my favorite. Great hook shape, beautiful bead and jewelry work, and super smooth. The latest acquisition is a light tan wood, with very prominent graining. Then it's topped with gold trims, and a swirly brown and gold bead. I now own 3 Sonshapes, a J in purpleheart with silver trim and my birthstone, a garnet; a K hook in Gemwood (green, wood/resin blend)with a lampworks bead with a pink rose, and the L hook with the brown and gold. I'm hoping to get some pictures of the hook collection, soon. Dee's doing more cool things! Just read her journal daily "Crochet with Dee"
Today Dee has pictures of overlay crochet worked with beautiful summer colors of embroidery floss. What a sensational idea! Those are gorgeous. I was thinking of taking the overlay square that I created in Melody's class at the Spring Conference and making it into a pillow. I think I mentioned that I was thinking of then entering it in the County Fair. But my daughter says the colors are hideous. Hey, the instructions for the class said to bring 6 or 8 colors of yarns, it didn't say we were going to use them all on the same project! Anyway, if I was to select 3 or 4 shades of the same color and use the pattern to make a pillow top. I could select those colors that will look good on my couch, and have a use for the pillows when the fair is over. Dee has a very good entry on copyrights on patterns. "Crochet with Dee" Please remember that you can make a copy of a pattern for personal use, but not to give to friends. I'm such a stickler that I don't even make a copy for personal use from a library book, only from a book that I've already purchased. Now, why make a copy if I already own the book? It makes crocheting so much easier. First I make notes about what colors I'm planning to use. Then I take the copy to the store with me, why lug the book? I then have the information about how much of each color I need to purchase. If they don't have the colors I was thinking about, and I choose other colors I can still get the right amounts of yarn. When I start swatching, I make notes on my copy about gauge, and note what size hook I finally need for the project. As I work, I can jot notes about stitches or about the wording. Sometimes the pattern is correct, but the designer worded it differently than I'm used to, and I can put it in familiar terms. Other times, there might be an error in the pattern and I can make the correction right where I'll be able to find it the next time I use that pattern. I also note the date I started the project, who it was for, and anything else that might be helpful later. Finally, I put the copy into a page protecter, add some samples of the yarn used, and the important part of the yarn wrapper, and photos of the final project. These pages are filed into a yearly project binder. It's a great record of projects, but also a resource...what was that really soft yarn I used on the blue afghan? That doily pattern was in what book? Friday I completed the spider web doily, and blocked it. It it beautiful! Then with advice from daughter #2, selected an afghan pattern. It is from the Needlecraft Shop Afghan Collector's Series. I've got a full 3 ring binder full of these patterns, and have enjoyed sorting through them. I've made a list of the patterns that I think I can convert to Tunisian, and a list of the ones I want to make in classic crochet. This will be the first that I've actually made directly from the pattern. It involves front post and back post doubles, front post and back post trebles, and creates cables, braids and basketweaves. I finally took my pattern and my swatch to the computer and started a spreadsheet. I was reading the pattern, counting stitches, typing, re-reading, re-counting, frogging and stitching. Sounds like frustration? I was happy in my problem-solving! I swatched the full width of the afghan for 5 rows, so that I'll be confident when I actually start. May go out for yarn today, it's on sale at AC Moore. While trying to decide on a color, I pulled out the Red Heart color card that I bought from Herrschners. "Herrschners website" I discovered that I had a tool that people on Crochet Partners have been asking about! It has a list of the variegated yarns, and matching solid colors! I was at the library for a MathCounts session with some students, and on the way out noticed they had magazines for sale. I started casually flipping through them, and found a lot of pattern books, cross-stitch, knit and crochet. I picked out a Red Heart booklet "Lustersheen Classics to Knit and Crochet". There are 5 sweater patterns, 3 knit and 2 crochet. One of those is a nice looking cardigan. Next a Red Heart booklet "Elegant Classics to Knit and Crochet", this has a sweater jacket that is fabulous. Very Classy. Patterns in both books have directions for size 10-12, 14-16, and 18-20. I also picked up 2 "Knitting Digest". Why? you ask. Jane, you don't knit. Well, the Sept 1997 issue has a pattern for a Rose Garden Afghan, complete with a graph. I can use this to create the afghan in Tunisian crochet. It also has a baby's "Rainbow Crib Cover" made with a simple stitch that I think will convert easily to Tunisian. The July 1998 issue has a beatiful top called "Ripple Lace Tee". I love the stitch design, I'd like to try this in Tunisian, but it does not look easy. There is also a baby afghan called "Baby Love Blanket" that is white with hearts in pink, blue, green, peach and lilac. Graph! This is another future Tunisian project! At 25 cents apiece, a definite bargain. PAS, Pattern Aquisition Syndrome! Yesterday I spent some time getting information on this year's County Fair. I made a list of all the categories that I might like to enter, and started a list of items (WIM). A fellow crocheter posted a message on the cp list "Crochet Partners" with a doily pattern. I looked at the pattern, and other doily patterns on Coats and Clark "Coats and Clark thread patterns" I selected a pattern and made a pretty doily in bright purple thread. Took only about 2 hours to work. I blocked it today, but not sure that's it's challenging enough to place at the Fair. Today I looked at the doily patterns I have on my computer. Most of these were purchased from "Crochet Memories" This is an awesome site if you like to work in thread. Patterns range from beginners to advance. Some are free, others cost a few dollars. All patterns have color pictures, are extremely well written, and are accurate! Highly Recommended!! So tonight I started another doily, it has a spiderweb design on the outside. I'm working it in a light aqua. I worked about 4 hours tonight, I figure about an hour tomorrow and I'll be ready to block it. Today, I started to narrow down what other patterns I might like to use. I want an afghan pattern that is challenging enough that I don't get bored while working it, and that looks challenging. Last year's entry involved linked front post trebles, and linked back post trebles. It took Best of Show at the County Fair, but didn't place at the Farm Show, which is equivalent to a State Fair. I think I've narrowed things down to 3 afghan patterns, 1 small, 1 medium, 1 large; a baby coat and dress; baby's sweater, bonnet and booties set, a child's hat, scarf and mittens set; and a woman's short sleeved sweater. This one is finished! 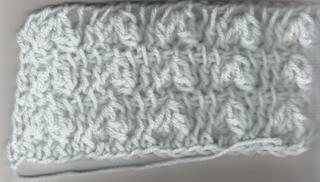 I'm also thinking of working my overlay crochet swatch into a pillow. I finished the glitter shawl today. It is really beautiful, daughter is thrilled and it's packed in the suitcase. She leaves for Europe tomorrow! I wrote the directions for the Tunisian cluster stitch and posted them and scanned pictures to the Yahoo Tunisian crochet group of which I'm a member. While watching tv last night I frogged the ruffle on a baby blanket that's been on hold. I think that I'm going to skip the double ruffle of the pattern and add a simple border. It is for a boy, blue and white, so want something a little less frilly. I bought the Jan/Feb issue of Piecework magazine off their website, it was mentioned on Crochet Partner's message board. I enjoyed reading some articles on the history of handmade gifts during the 1930's, blackwork stitchery, shawls of a community in Ecuador, sweaters from a village in Finland and Tunisian crochet. The sweaters combine intricate crochet designs with knitting. They are made in a group, somewhat like a quilting bee, the work is passed so that each woman works her best part on each sweater. The Tunisian article has a small purse designed by Kathleen Power Johnson. I took an excellent class with her at the Spring Conference in Valley Forge this spring. The purse in a clutch type, and the pattern is easy to work, but very detailed. I see a project in the future! Yesterday was a busy day since both my girls are home at the same time for only a few more days. The 3 of us went out to see the new movie, Charlie and the Chocolate Factory. Crochet sighting! Then we went out to pick up the new Harry Potter book, we were at the book store from midnight to 2 am. I had plenty of time to check out all the crochet books. I didn't find any new ones that I just had to have. Well, I have purchased a lot of books in the past year! Today I spent with hubby, getting necessities for his summer camp with the Boy Scouts. We started at a Scout store in Valley Forge, then headed to Cabela's in Hamburg, PA. On the way we saw a sign for the Daniel Boone homestead, so we stopped to check it out. We watched the movie, and walked around and saw the outside of several of the buildings. The next tour was too late for the rest of our trip. The parking lot at the Cabela's is huge, as is the building. I teased that they had a restaurant inside (on my mind, as we had plans to stop somewhere for lunch, and hadn't). We did a little shopping, smelled barbeque, and discovered the restaurant! So we had a late lunch/early dinner, then did more shopping. So I haven't really had crocheting time for two days. Several people have complimented the baby afghan that I have posted a photo of on "the Tunisian Crochet Group" on Yahoo. The blanket is classic crochet done in a cluster stitch. The pattern is from The Best of Terry Kimbrough's Baby Afghans. The cluster stitch is one of my favorites, and have been getting compliments, so I decided to try to work out the stitch in Tunisian. Success! I will post it here and to the Tunisian group tomorrow when I've had some sleep. Dee's got another great idea to promote crochet! Trading cards with a picture of the crocheter, along with "stats". Check out "Dee's trading card"
That might be fun, I'll think about my card tomorrow. Just spent 2 hours online trying to find cheap airfare for my sister, so we can get together for vacation! I'm all done for tonight. I finished the yellow Homespun shawl. Tunisian doubles are definitely the way to go when you want to make a shawl quickly. Worked more on the glittery black shawl, it's moving quickly, too. I also made a swatch with my wooden afghan hook, for those pictures I hope to get to soon! I tried the back crossed doubles as suggested by ARNie on Tunisian Crochet group. It's a fun stitch, I have several ideas for what to make with this stitch. As usual, more ideas that time. I also took pictures of several completed items. Now if I can get them up on this blog! No, that's not a typo. There's a yarn store in Seattle that is sponsering a knit and crochet in public event at a baseball game! They'll be offering help, samples, and a rebate if you wear something you made from yarn purchased at the store! Check out the fun "The Seattle Mariners Stitch 'n' Pitch Night" What a great idea! I haven't posted recently, but have been working steadily on the glittery shawl. It's about 3/4 finished. "Tunisan Shawl" pattern at that site. ARNie asked if she could add the links to her site. COOL! Since today was the July meeting of the Shawl Ministry at our church, I spent most of the afternoon finishing the Tunisian Sampler shawl in purple variegated Homespun. It was fun learning some new stitches. I learned that not all fancy stitches show up in the Homespun, so have better ideas about what stitches to use for future shawls. Next I started another Tunisian shawl in a bright yellow Homespun, called Lemonade. I had planned to alternate 3 knit, 3 purl. 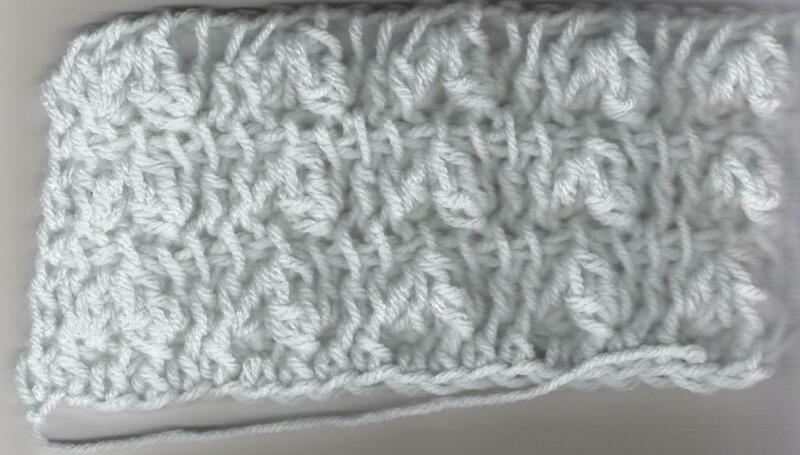 However, the was too heavy with the Homespun yarn, so I used the Tunisian double crochet. BTW, I recently came across this double crochet description with the name Double crochet loop. Can't remember right now where that was. Don't know why they used this distinction. I'm about half way through this shawl already! The doubles work up very fast. I came across a new basketweave pattern that I want to try. Most basketweaves use a square, this one is more rectangles. "Basketweave Fiber Hug Shawl" The pattern is a knit pattern, but that converts to Tunisian easily. I'm thinking of getting some white sport weight and making one for the Shawl Ministry baptism shawls. WooHoo! It's finished! It's definitly a nice looking garment. I threw it in the washer and dryer hoping that the top shrinks the same percentage as my swatch. As soon as it went into the washer, I had hook, yarn and pattern and started on the next project. It's called Glittering Gold Shawl from 24-hour Crochet Projects by Rita Weiss. I may need to rename the pattern, as I'm working it up in Paton's Brilliant black with silver. It's for daughter #1, the opera stage manager. She's leaving for Europe in 2 weeks. Then we need to get busy and sew the skirt to go with the corset. The skirt itself won't take too long, but we bought a lot of black braid & other trim. Hope I can attach it all with the machine, and don't have to hand sew all that trim. There's a beautiful Graydog Tunisian crochet hook on eBay, it has the auction crowd in an uproar. Take a peek at it before the bidding ends in 2 days. It's now at $369.99! "Graydog Tunisian hook"
UPDATE July 7th - with 8 hours left in the bidding, the price is up to $526.99! Wait, I need to look at it again. Maybe I missed something...the bead on top is the Hope Diamond! Nope...what is it about this almost regular Tunisian hook? Here is an interesting pattern "Coffee maker Doily"
It's a beaded wire doily to go on the hotplate of your coffeemaker. That's something I never would have thought about making. The pattern is great because it offers a lot of tips for those new to crocheting with wire, or new to adding beads to crochet. But I also love some of the descriptions "Chain 30 like a manly crocheter", and "turn gently like the mother of a wee babe". Have fun! I'd love to see pictures if anyone makes one of these doilies.